The M6 PRE features a wide range of inputs, making it the ideal system hub for any high-end audiophile. 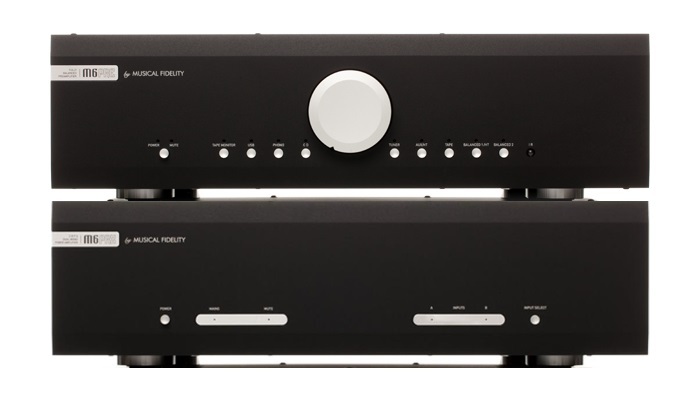 With two balanced XLR inputs and four unbalanced RCA inputs, the pre-amplifier also features a built-in asynchronous USB DAC capable of 24-bit/96kHz audio playback, and a switchable MM/MC phono stage. There is also the added convenience of a switchable RCA input for Home Theatre bypass. The M6 PRX is a fully-balanced dual-mono power amp for high-fidelity applications. Behind its classically simple, elegant design lies a true hi-fi monster that will drive any speaker with ease thanks to its 230 per-channel output, delivering a deep and detailed sound stage that will leave you breathless. At Fanthorpes we love to trade in, so if you want to trade in your existing HiFi against the Musical Fidelity M6 Series, contact us and we will let you know what it is worth as a trade in.